1. Soludos Lace Up Sandals - I adore Soludos, and the detail on these sandals is just enough to make them interesting but still wearable with anything. 2. Loeffler Randall Starla Flat Sandals - Gold. Stars. Straps. Yes to all these. 3. Loeffler Randall Elyse Sandals - Straps with a higher heel can be tricky, so I appreciate that the rest of the shoe is quite simple to allow the lace-up look to be the feature. 4. Aquazzura Christy Flats - I have been lusting after these for years, and while they are a splurge, they were one of the first lace up shoes that started this whole trend. The shape of the shoe make them chic enough for dresses and skirts, while the simple solid color and flat soles allows for a casual look as well. 5. Sigerson Morrison Wedge Pumps - If a wedge, lace up sandal and pointy toe pump had a baby, this is what it would look like. And I love it. 6. 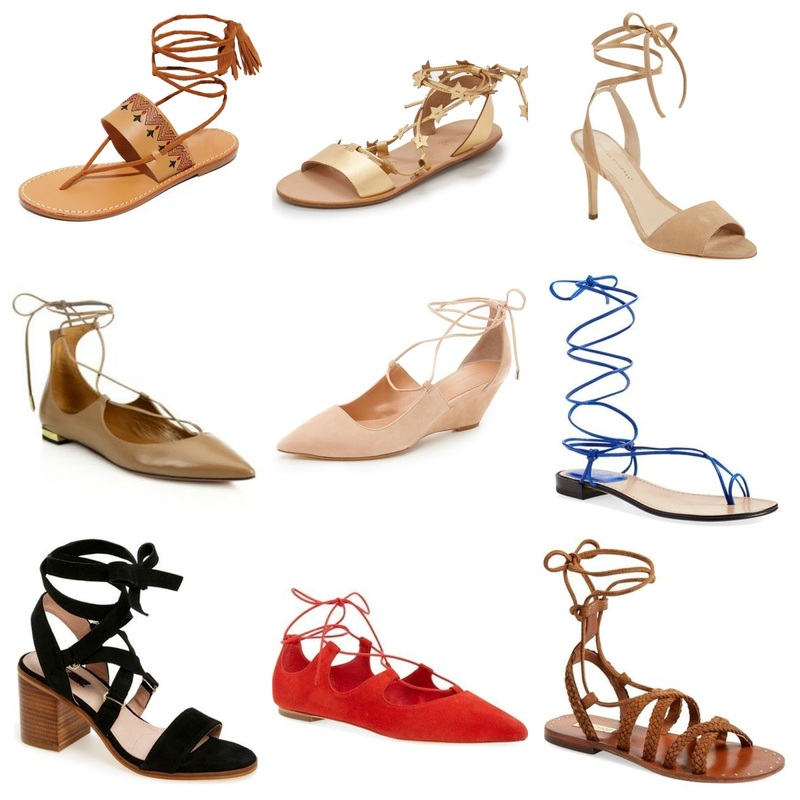 Stuart Weitzman Lace-Up Flat Sandals - I like that these sandals are simply ALL laces. And it comes in a ton of different colors! 7. Topshop Nadra Sandal - These dabble in the lace up trend but only slightly so I can see these being worn for years to come. What a great classic black sandal for the summer! 8. Loeffler Randall Ghillie Flat - There are a ton of knock-offs of the Aquazzura Christy Flats, but I find that the Loeffler Randall ones are some of the best. And this shade of red is my favorite so that's why I love them even more. 9. Topshop Gladiator Sandals - A gladiator sandal that doesn't lace all the way up to your knee - yes! I can appreciate the gladiator trend, but like the understated version of this sandal so that it will still be current for many more seasons. Hope everyone is having a great weekend! I am currently working on putting together some video ideas for the next month - please feel free to leave any requests or suggestions in the comments below.